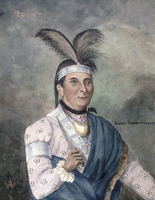 WEYAPIERSENWAH (Weh-yah-pih-her-sehn-waw, Wey-a-pic-e-sen-waw, Waugh-we-ya-pe-yis-sin-ious, Wawapessenwa, Blue Jacket), Shawnee war chief; b. mid 18th century; d. c. 1810, probably in the Detroit River region. One of the earliest mentions of Blue Jacket in white records dates from January 1773 when missionary David Jones visited “Blue Jackets Town” near the Scioto River (Ohio). In the following year Blue Jacket was one of the Indian leaders at the battle of Point Pleasant (W.Va) in Lord Dunmore’s War, and during the American revolution he was an ally of the British. By 1778 his town on the Scioto was deserted, and he had a new one on the site of present Bellefontaine, Ohio. This town was burnt in the expedition of Kentucky frontiersman Benjamin Logan in 1786. Blue Jacket negotiated with the Kentuckians at Limestone (Maysville, Ky) in 1787 but was raiding into Kentucky the following year. By the late 1780s Blue Jacket had settled in the region of the Miamis (Maumee) River in what is now northwestern Ohio and northeastern Indiana. In 1788 he had “a fine plantation well stocked with cattle” in the vicinity of the present Fort Wayne, Ind. 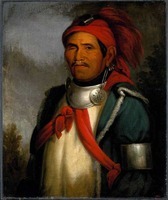 Along with the Miami chief Little Turtle [Michikinakoua] he was one of the main Indian leaders in the successful engagements with the American armies of Josiah Harmar and Arthur St Clair in 1790 and 1791. After Greenville Blue Jacket lived for a time near Fort Wayne, later moved to the Auglaize River near the present Wapakoneta, Ohio, and by 1801 had a home on the Detroit River. No doubt he visited Fort Malden (Amherstburg), Upper Canada, from time to time, since it was from that post after 1796 that the British distributed presents to the Indians south of the border. He signed the Treaty of Fort Industry in July 1805, by which part of northern Ohio was ceded to the United States. 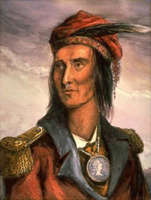 Early in their movement he became associated with the Prophet [Tenskwatawa*l and Tecumseh; for a time he apparently lived with them at Greenville, and he visited Chillicothe in 1807 as one of the Indian emissaries to the Ohio government. Blue Jacket was probably married at least twice – once to an American prisoner named Moore, and once to a half-Indian daughter of Jacques Baby*, dit Dupéront. His children included Nancy; Mary, who married Jacques Lacelle; George Blue Jacket, who was an interpreter for the British during the War of 1812; and Jim Blue Jacket, who was associated with Tecumseh and also took part in the war. PAC, MG 19, Fl, 5:233–35. Wis., State Hist. Soc., Draper mss, 11YY33. Anthony Wayne . . . the Wayne–Knox–Pickering–McHenry correspondence, ed. R. C. Knopf (Pittsburgh, Pa., 1960; repr. Westport, Conn., 1975), 296, 384, 390. Documentary history of Dunmore’s War, 1774 . . . , ed. R. G. Thwaites and L. P. Kellogg (Madison, Wis., 1905), 374n. [L. C. Draper], “Biographical field notes of Dr. Lyman C. Draper: Toledo and vicinity, 1863–66,” Hist. Soc. of Northwestern Ohio, Quarterly Bull. (Toledo), 5 (1933), no.4: items 175–76, 181–82. Indian affairs: laws and treaties, comp. C. J. Kappler ([2nd ed. ], 2v., Washington, 1904), 2: 39–45, 77–78. John Askin papers (Quaife), 2: 34n., 743. David Jones, A journal of two visits made to some nations of Indians on the west side of the river Ohio, in the years 1772 and 1773 (Burlington, Vt., 1774; repr. New York, 1971), 51–52. Mich. Pioneer Coll., 17 (1890); 20 (1892); 24 (1894); 40 (1929). Norton, Journal (Klinck and Talman), 187. The revolution on the upper Ohio, 1775–1777 . . . , ed. R. G. Thwaites and L. P. Kellogg (Madison, 1908; repr. Port Washington, N.Y., and London, 1970), 44n. [Thomas Ridout], “Narrative of the captivity among the Shawanese Indians, in 1788, of Thomas Ridout, afterwards Surveyor-general of Upper Canada, from the original manuscript in possession of the family,” Ten years of Upper Canada in peace and war, 1805–1815; being the Ridout letters, ed. Matilda Edgar (Toronto, 1890), 366. H. R. Schoolcraft, Travels in the central-portions of the Mississippi valley . . . (New York, 1825; repr. Millwood, N.Y., 1975), 49. O. M. Spencer, Indian captivity: a true narrative of the capture of Rev. O. M. Spencer by the Indians, in the neighbourhood of Cincinnati (New York, 1835; repr. Ann Arbor, Mich., 1966), 86–87. U.S., Congress, American state papers (Lowrie et al. ), class 11, : 564, 568, 571, 579. Handbook of American Indians (Hodge), 1: 155. Henry Howe, Historical collections of Ohio . . . an encyclopedia of the state . . . (3v. in 2, Columbus, Ohio, 1889–91), 1: 300. J. [E.] Bakeless, Daniel Boone (New York, 1939; repr. Harrisburg, Pa., 1965), 322–23. John Bennett, Blue Jacket, war chief of the Shawnees, and his part in Ohio’s history (Chillicothe, Ohio, 1943). [This is a standard work on Blue Jacket but contains material about his youth that is unproven and likely incorrect. r. h.]. W. Butterfield, History of the Girtys . . . (Cincinnati, Ohio, 1890), 410. 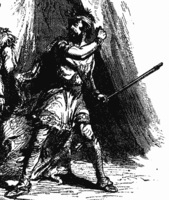 Benjamin Drake, Life of Tecumseh, and of his brother, the Prophet . . . (Cincinnati, 1858), 37, 94–97, 191. Henry Harvey, History of the Shawnee Indians, from the year 1681 to 1854, inclusive (Cincinnati, 1855; repr. New York, 1971), 112–14. L. U. Hill, John Johnston and the Indians in the land of the Three Miamis . . . (Piqua, Ohio, 1957), 8. C. E. Slocum, History of the Maumee River basin from the earliest account to its organization into counties (Defiance, Ohio, 1905), 243, 437. C. G. Talbert, Benjamin Logan, Kentucky frontiersman (Lexington, Ky., 1962), 210–11. Erminie Wheeler-Voegelin, “Ethnohistory of Indian use and occupancy in Ohio and Indiana prior to 1795,” Indians of Ohio prior to 1795 (2v., New York and London, 1974), 2: 532, 571; Indians of northwest Ohio; an ethnohistorical report on the Wyandot, Potawatomi, Ottawa and Chippewa of northwest Ohio (New York and London, 1974), 158, 243. B. R. Long, “Joseph Badger, the first missionary to the Western Reserve,” Ohio Archæological and Hist. Pubs. (Columbus), 26 (1917): 17–18. Reginald Horsman, “WEYAPIERSENWAH,” in Dictionary of Canadian Biography, vol. 5, University of Toronto/Université Laval, 2003–, accessed April 26, 2019, http://www.biographi.ca/en/bio/weyapiersenwah_5E.html.